Religion played a very important role in the lives of the Mexica people of the Aztec Empire. Thus grand temples were built throughout the Aztec Empire. These temples were called “Teocalli” which means god houses. The temples were used for worship and prayers in addition to various offerings to the gods including that of human sacrifice. The Aztec temples were built all over the Aztec Empire and in their most famous form existed as rooms at the top of step pyramids. However, the step pyramids were not always temples and could also be used for other purposes. Various types of great pyramids served as temples and they also varied in their size. The history of Aztec temples, just like other religious and cultural aspects of Aztec life, extended much beyond the Aztec empire. A lot of great pyramids existed before the Aztec Empire were established and these pyramids were later declared sacred by the Aztecs and used as temples. For instance, the Great Pyramid of Cholula began to be constructed in the 3rd century BC and was completed by the 9th century AD, much before the Aztec people appeared on the scene. 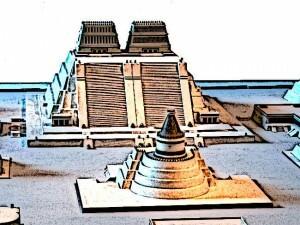 But the Aztecs also constructed various new pyramids which served as temples. An example of this later type of temples is the famous Templo Mayer whose construction began after 1325. Aztec Temples Templo Mayor Serpents – Perhaps the most famous of all Aztec temples is the Templo Mayor whose construction began as early as 1325. Broadly speaking, there were three main types of Aztec temples. The first type was built on the twin stairs pyramid and consisted of two separate temples at the top reserved for two different gods. The prime example of this kind of Aztec temples is the Templo Mayor. These temples also had a double staircase, one for each temple. The second, and less common, type of Aztec temples was built on round pyramids. These temples were dedicated to Quetzalcoatl, the Aztec god of wind. The third type was of smaller temples built on smaller pyramids. These temples were built in small cities founded in later Aztec history. The small temples had one set of stairs and a square base just like the twin stair pyramids. Perhaps the most famous of all Aztec temples is the Templo Mayor whose construction began as early as 1325. It was rebuilt six times and the final construction was not completed until 1497. This temple was the most sacred site of the city of Tenochtitlan and its twin temples were devoted to the gods Huitzilopochtli and Tlaloc. It was accompanied with various other buildings including pyramids, ornamental walls, and gathering places etc. This temple was 60 meters in height and built of stone. Another famous Aztec temple was the Pyramids of the Sun and the Moon which, as the name suggests, was devoted to the gods of the sun and moon, Tlaloc and Chalchihuitlicue. This, just like the Great Pyramid of Cholula, was built before the Aztecs but nonetheless served as a sacred temple for the Aztecs. Aztec religion was polytheistic and thus a variety of gods were worshipped in their own ways. The primary purpose of the Aztec temples was to worship these gods in the form of rituals and prayers and to offer human sacrifices. Thus rich religious symbolism associated with different gods was used in these temples. For instance, the temple of Tlaloc, the god of rain and fertility, was painted in white and blue colour which symbolised moisture and water. Religious ceremonies and festivals in Aztec society were held at the beginning of every 20-day long month. Since the Aztecs worshipped many different gods, different temples were devoted to the worship of different gods. The most important gods for the Aztecs were Tlaloc, the god of rain and fertility, Huitzilopochtli who was the patron god of the Mexica tribe, Quetzalcoatl who was the god of civilisation and order, and Tezcatlipoca the god of destiny and fortune. Different temples were dedicated for all these gods. 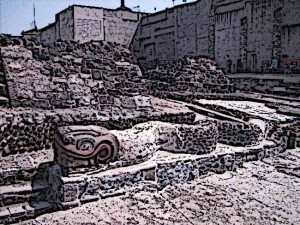 For instance, the Templo Mayor had twin temples dedicated to the gods Huitzilopochtli and Tlaloc. The temple at the Great Pyramid of Cholula was dedicated to the worship of Quetzalcoatl, the patron god of the Mexica people. Similarly, the temples at the Pyramids of the Sun and the Moon were dedicated to Tlaloc and Chalchihuitlicue. Additionally, there were many small pyramids reserved for other gods. 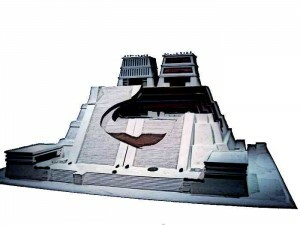 Aztec Temples Scale Model Templo Mayor – This temple was 60 meters in height and built of stone. The Aztecs used a variety of materials in the construction of their temples and pyramids. Since the city of Tenochtitlan was located on swampy ground, special attention was paid to making pyramids and temples with solid foundations for which stone platforms were used. Special kinds of volcanic stone called tezontle was used for the construction of these platforms. Materials like rubble and limestone were used in the construction of the rest of the temple. They had steep double staircase at the centre with balustrades going up the sides of the steps. For the decoration of the platform, sculpted stone blocks and skulls were used at the end of the balustrades. Smaller temples could have thatched roofs while roofs of the bigger temples were generally made of wood. The inside of the temple walls were ornamented with sculpture and paintings. Religious symbolism was abundantly used in Aztec temples. This included various animals such as snakes and eagles in addition to paintings about Aztec cosmology. Religion was of supreme importance in Aztec society and thus a variety of large and small temples were built throughout the empire. Larger temples were mostly built on the top of the pyramids which could be built in various forms. The Aztec temples were dedicated to different gods since Aztec society was a polytheistic society. The temples were used for worship, prayers, and offering of human sacrifices to gods. These human sacrifices were a common feature of the Aztec religious ceremonies. A variety of construction material was used for Aztec temples with volcanic stone being used to provide a solid base. Additionally, rich religious symbolism was used in the painting of the walls of the Aztec temples.